Ah, the joys of blogging. 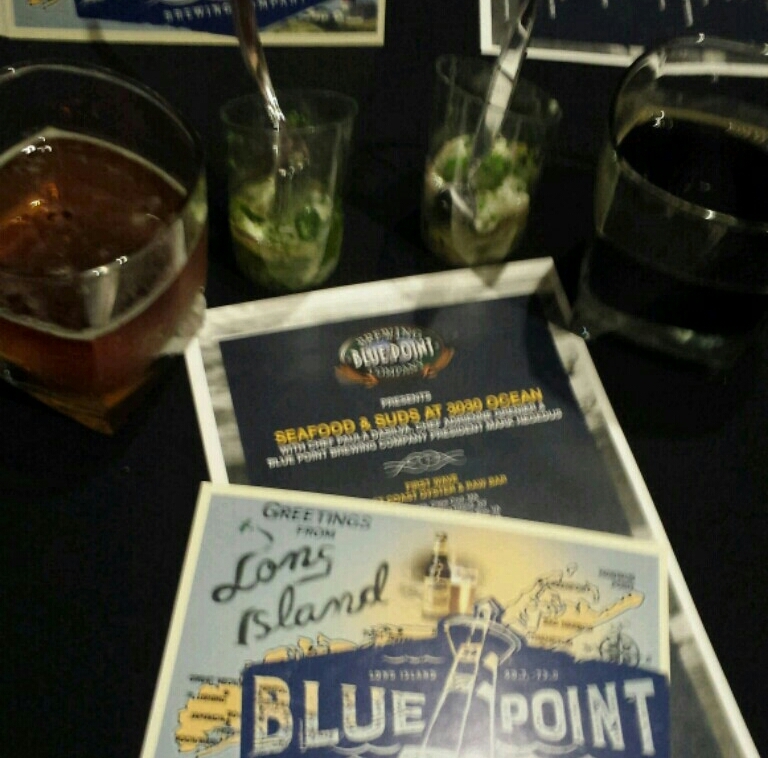 I know it’s not Florida beer, but I got an invitation from Blue Point Brewing in Long Island, New York. They’ve been doing a little national tour along with Paula DaSilva, celebrity chef and former Hell’s Kitchen contestant. Basically, they’re bringing their beers, local cuisine, and some culinary skills on promotional tours. Invitation only, chefs and media were invited. And lucky me was able go get an invite! So I went with my beautiful wife (who, I might add, looked extra beautiful that evening) on a little impromptu date night. Grandma and Grandpa had the kid, so it was our time to relax. And eat awesome seafood and drink great beer. The first course was an oyster raw bar with a ceviche made from fresh fish, locally sourced peppers, cilantro, and lime. We’re not big on oysters, but ceviche is a love. And it was great. Accompanying this was Blue Point’s signature Toasted Lager, which is a pretty good standby for a moderate, flavorful brew. Also at this time was Blue Point president Mark Hegedus. 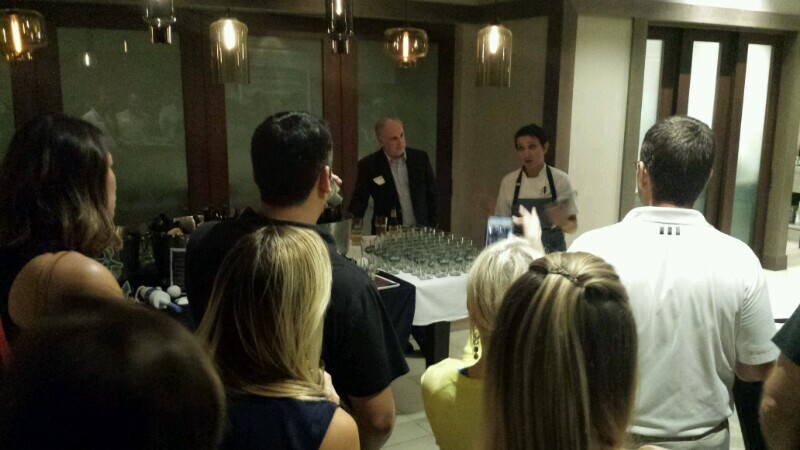 Mark was amazingly gracious with his time and joined my wife and I in a few passed plates while telling us a lot about Blue Point, their partnership with Chef DaSilva, their partnership with Anheuser Busch (of course I had to mention it), and more. Apparently Florida is now Blue Point’s second largest market behind New York, so they are going to be focused on an increased presence down here. THat was probably a reason for so many Anheuser Busch name tags in the crowd. And, as for the purchase, Mark let me know that AB was very hands-off, letting Blue Point do what they do while giving them some nice resources, like access to hop farms in Idaho. Say what you will, the beer was good. Moving on to the second courses, and there were some winners. 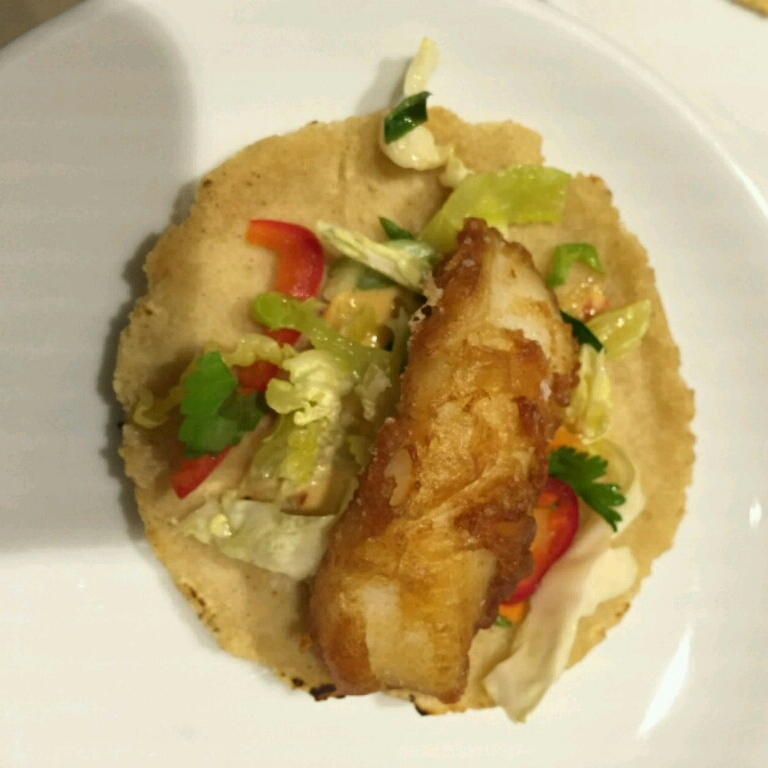 The biggest dish of note was a fish taco, grouper fried in a Toasted Lager breading and served with slaw and a spicy aioli. Every time a tray of those came out, they disappeared. Every. Single. Time. Also, sticking with the Toasted Lager, was a clam chowder made with the same, one of the best of the night. 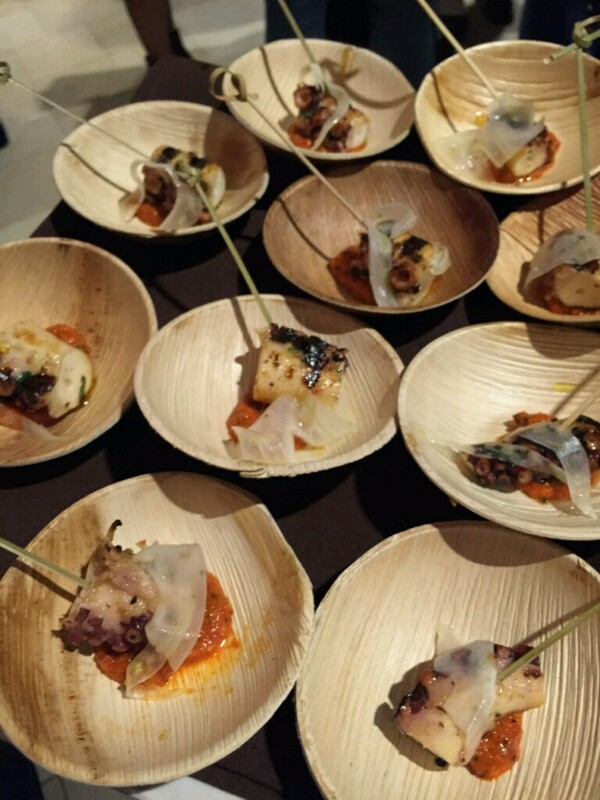 Charred octopus was seasoned and cooked to absolute perfection, then served atop shaved fennel and romesco. Charred octopus ready to go. 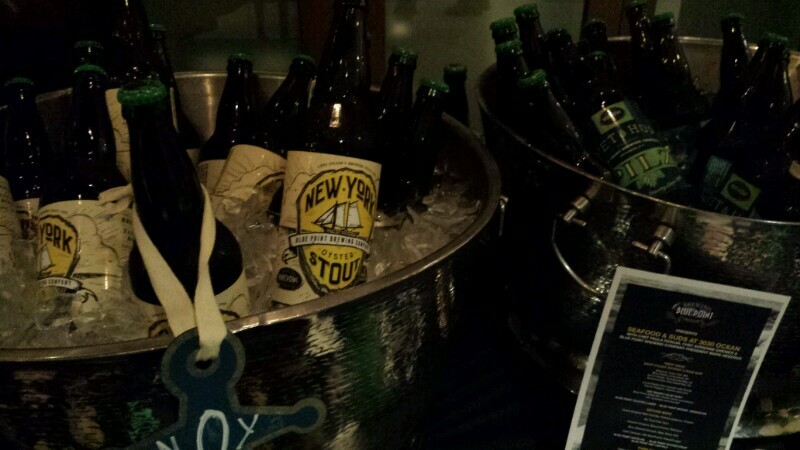 Of the beers served at this point, but my wife and I liked their New York Oyster Stout the best. A good, moderately strong stout made with oyster shells and bay salt. Rich, with only a light oyster flavor. There were also bombers of Wet Hop Pilz available, a pilsner hopped with lots and lots of freshly harvested Saaz. It was definitely a hop lovers beer, and had a lot of floral notes to it. Chef DaSilva was present, actually passing around a lot of these herself, and made herself graciously available as well. 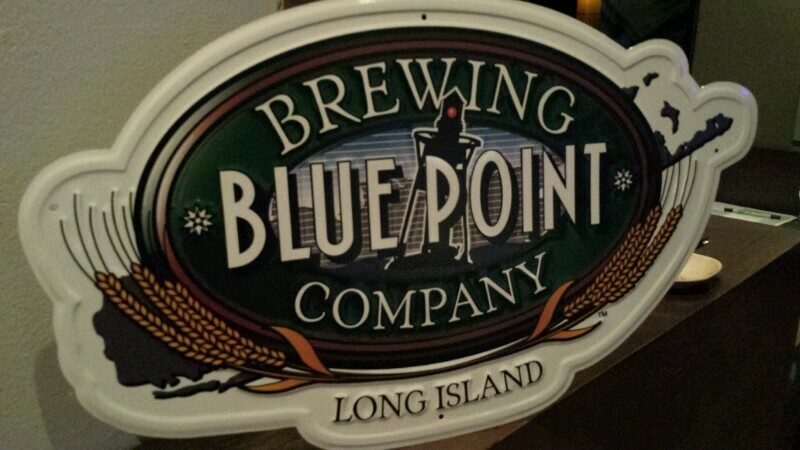 She said she, admittedly, hadn’t been big into beer before her partnership with Blue Point. Now, wonderfully enough, she can see the joys of beer and has even started branching out with some recipes she’s trying for her own personal enjoyment. Mark Hegedus and Paula DaSilva speak to the crowd. She did have an interesting point when it comes to beer vs wine. It’s admittedly a little more difficult to cook with beer than with wine. With wine, for example, you can use almost all of them to deglaze. But with beer, there are some styles that aren’t suited for some things, and you really have to know your styles to make sure you don’t have any issues. I can’t see them making the clam chowder with a quadrupel or a berliner weisse, for example. But if you take a cherry-infused Russian Imperial Stout and make a chocolate dessert with it, that works. Very well. Dessert, or specifically the beers being served with dessert, was something I was particularly looking forward to. What was great was that Chef DaSilva created a dessert specifically for, and made with, each of the beers being served as well. The good dessert was a sticky toffee and hazelnut cake made and served with Blue Point’s Oatmeal Stout, a moderately smooth and creamy brew that ended up being nice and meaty. The better was a chocolate boudino (basically a really thick custard) that had been made and was served with their Cherry Imperial Stout. Ordinarily I am not a fan of imperial stouts. But not only was this one a little mild while keeping all of the big, roasted, dark flavors of the style, but the sour cherry adjunct brought a great, light sweetness that the beer really benefitted from. Quite tasty, indeed. Bombers of New York Oyster Stout and Wet Hop Pils ready to go. In the end, it was a nice evening. Met a few people, took home more bombers than I probably should have, and left suitably stuffed. It will be nice to see Blue Point expanding their offerings to include many of the beers we sampled this evening, plus a few others. Thank you to Sarah and the team at Watershed Communications for the invite, and Mark & Paula and the rest of the team at Blue Point for the great food and drink. I would definitely take the opportunity to take part in whatever event Blue Point would have to offer. In addition, AB has tried to stifle craft beer growth by resisting, and limiting the use of growlers, among other things. Now that they have merged and control a much larger share of the market, no telling what they will be able to do. Enjoy your blog, and you might consider keeping us posted on other craft breweries falling under the control of the beer conglomerate for those that may be interested. Kind of curious about your thoughts as well as your readers about the above topic. First, thank you for the thoughtful response. To be honest, I expected to have more crazy anti-AB comments. That being said, I got the feeling (and Mark sort of confirmed it) that AB leaves them alone. That makes the best business sense, really. Sure, pump in capital to grow the businessn but don’t touch the important stuff. I saw it when Duvel bought Boulevard; same thing, really. This was a special post. My focus was and always will be Florida beer. And if a Florida brewery gets bought, I’ll report on it. But I really don’t think that’s going to happen anytime soon.